Everyone, it seems, is on an endless search to find the perfect chocolate chip cookie. Crunchy or soft, chewy or melt-in-your-mouth, each person has a personal preference with a set of criteria to match. There is a reason why there are twelve million hits when you search for the "best chocolate chip cookies"—like a soul mate, we all want to find "the one." While the back of the Nestlé Tollhouse chocolate chip package and the New York Times' cookie recipe are among the top, most popular contenders, my cookie preferences fall into a much different camp. Have you found your perfect chocolate chip cookie recipe? My mother's homemade cookies consisted of store-bought frozen cookie dough, already packaged to go from bag to baking sheet without needing a single utensil. To be fair, she did make her daughters cookies from scratch occasionally, but the frozen cookies are the ones we remember and hold in our hearts. When my sister and I head home over long weekends or holidays, she always has a package in the freezer waiting for us. It does not matter that I am a proficient baker and could make a batch of cookies with my eyes closed, these are the cookies I look forward to most. Nostalgia has a sneaky way of suppressing any qualms I may have about store-bought baked goods. Truthfully, I believe the qualities of the cookies we grow up with are the same as the cookies we prefer once when we grow older. My grandmother makes delightfully crunchy cookies that baptize the kitchen table with cookie crumbs each time a bite is taken. My dad loves these cookies, calling them "milk dunkers." My sister and I make help to make a further case for this claim. When I set out to make a batch of cookies last weekend, I did not intend to create my boyfriend's perfect chocolate chip cookie, but somehow it happened. I had almond butter in the cupboard and, inspired by these flourless peanut butter cookies, I played around with a few ingredients. The batter is a bit oily from the almond butter, but the nut oil crafts the most delightfully chewy cookie once it bakes. After stealing two straight from the oven, my boyfriend asked me what was in them, astonished at how unexpectedly perfect he found them. When I told them they were gluten-free, he refused to believe me, claiming the texture was too similar to a traditional chocolate chip cookie. He ate six more before the day came to an end. I have already purposely filed this recipe away for the future. 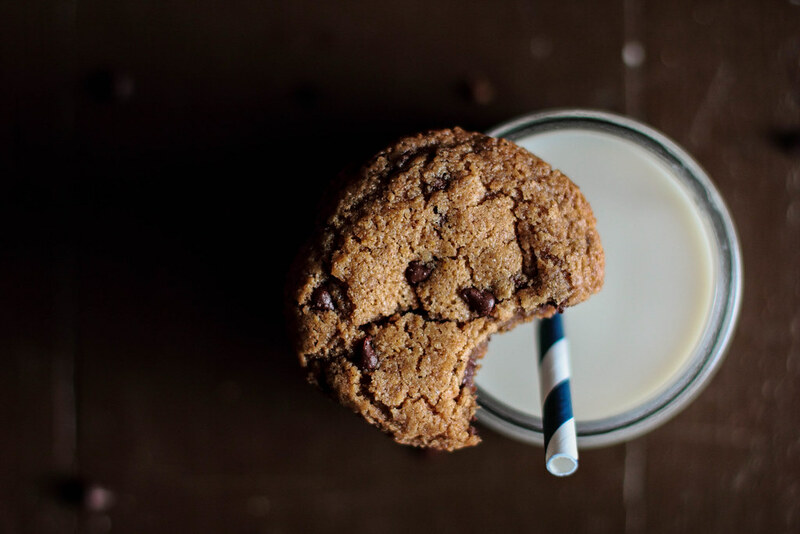 Almond Butter Chocolate Chip Cookies are fantastically chewy and, shockingly, gluten-free. Almond butter forms the base of the cookies, though it adds only a subtle flavor (if any) to the final product. While sugar sweetens the cookies, a pinch of salt really helps to bring out a contrast of flavors. I prefer to use miniature chocolate chips because they provide a little chocolate to every bite, but larger chocolate chips will work just as well. These cookies are something special, trust me. In a medium mixing bowl, mix together the almond butter and sugar. Mix in the egg, vanilla, baking soda, and salt until evenly combined. Stir in the chocolate chips. Drop cookies by the tablespoon onto a baking sheet and bake for 10-12 minutes. Cool on the baking sheet for at least 5-10 minutes before moving to a cooling rack to cool completely (the cookies will be very fragile and need to set-up before they can be moved).